Cure is described by kyth + kyn has a blend to help with all your #yolo life decisions, in relation to drinking, and it made me laugh when I first heard it (and after tasting it, I really wanted to buy it). If you saw my previous review of kyth + kyn’s Glow, the packaging is fairly similar. 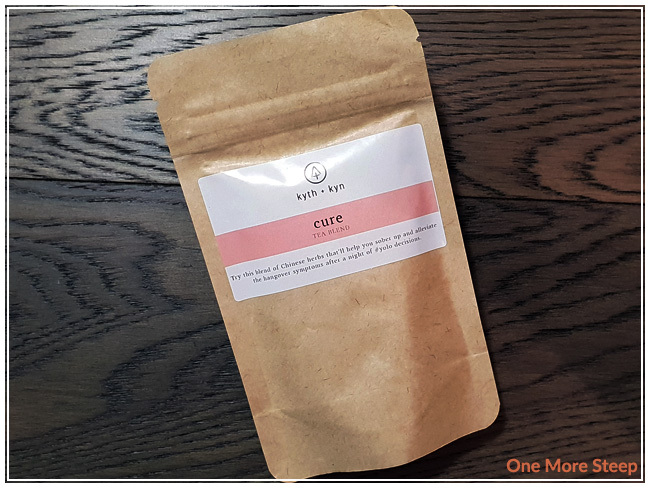 Cure comes in a kraft paper pouch that’s resealable, has as plastic liner inside to help keep all the ingredients dry and keeps everything from getting stale. The first ingredient that I really smelled when I opened the pouch was the ginger. 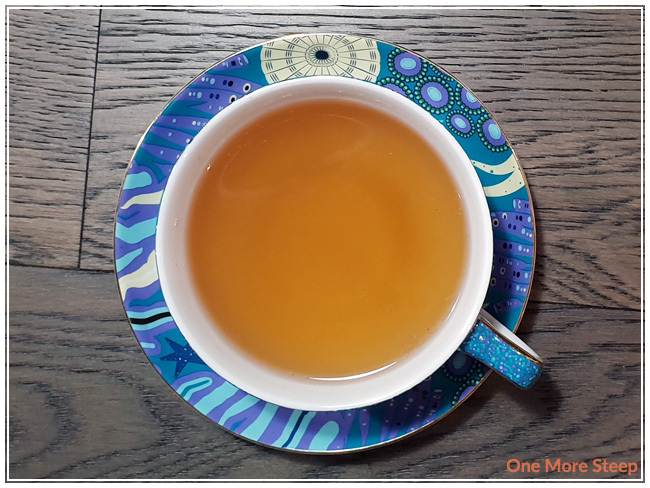 I found that it was quite strong, and I could also smell something else that was almost spicy that was not the ginger, but I’m not familiar enough with the other ingredients to really know what it is… It smells good though, whatever it is! Cure consists of: winter melon seed, pueraria, mulberry leaf, and ginger root. 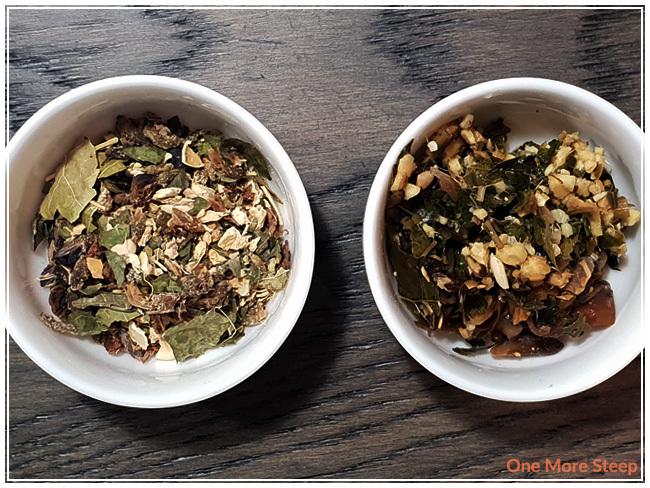 kyth + kyn suggests steeping 1 to 2 teaspoons in hot water and to steep for 3 to 5 minutes. The recommendation is to add honey or other sweetener to taste. I opted to do an initial steep in 200°F (93°C) water for 5 minutes. Cure steeps to a beautiful orange colour that has a strong ginger and spicy aroma that is very similar to the dry leaf. I found that the ginger flavour is pleasant, with a bit of natural sweetness surrounding it. I can taste that there are other ingredients in it, I don’t know what winter melon seed or pueraria are supposed to taste like, but I presume that one of them offers that spicy flavour that I’m getting from the tea. It’s not like a chili oil or hot pepper type of spice, but more of a spices type of spicy (think chai, but not in ingredients that I’m familiar with). The warming qualities from the ginger are nice and really warm me up! 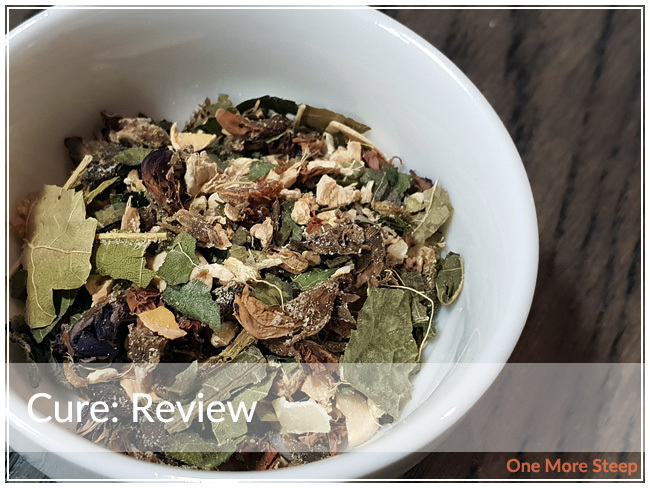 I resteeped Cure twice, adding an extra 30 seconds for each steep, and I found that the flavours were quite nice still. The flavours stayed pretty comparable to the initial steep and I thoroughly enjoyed it each time. I’d probably really like this one if I had it when under the weather or had a stomach bug because I think it would help settle the stomach quite easily. I loved kyth + kyn’s Cure. 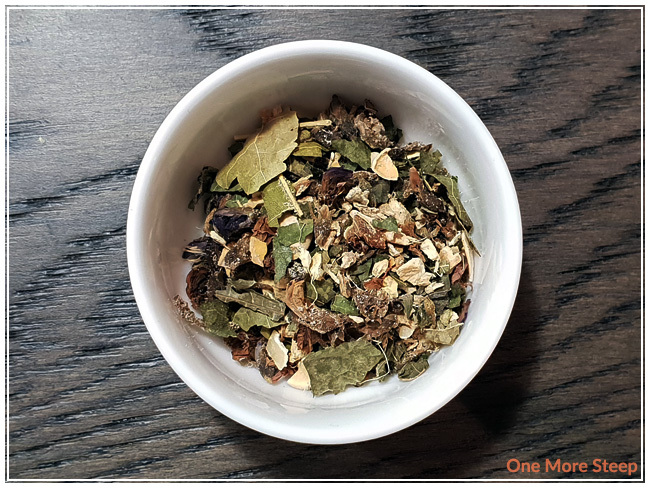 I found that the herbal blend did a very good job with resteeping, the ginger flavour was very enjoyable and it balanced well with the other ingredients. I wish I knew what the other ingredients tasted like or smelled like on their own so I could describe it better, but I found that the flavour was delicious and I didn’t have to add any sweetener to it to make it palatable. I do love the ginger in this blend though, and thought it was tasty.